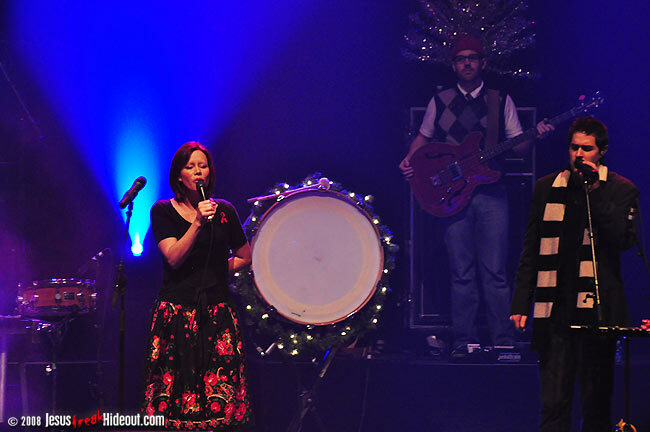 To say I was greatly disappointed that last year's Third Day and Jars Of Clay Christmas tour came nowhere near close enough for us to attend would be a masterpiece of understatement. 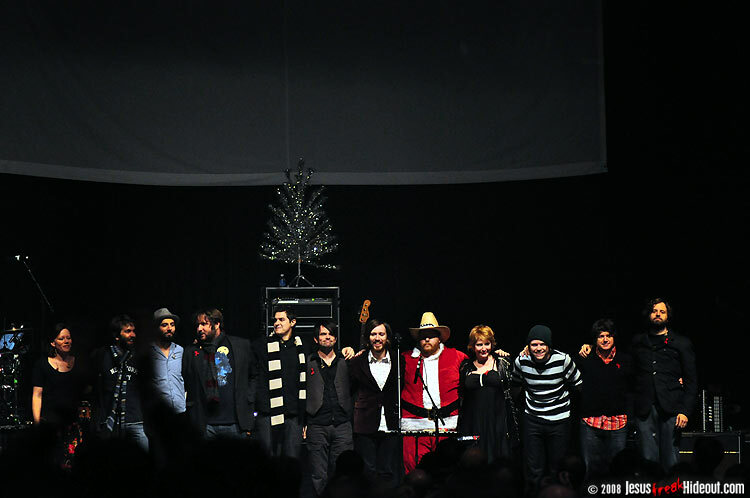 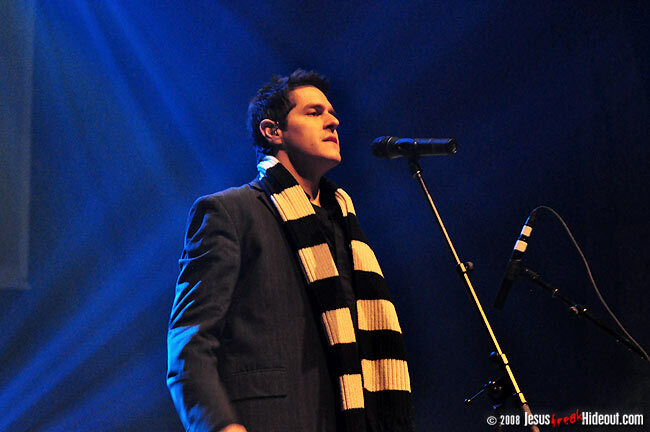 However, I viewed it as very much a Christmas gift to find that not only was Jars Of Clay headlining a Christmas tour this Fall, but they were taking out on the road with them Leeland, Sixpence None The Richer, and Sara Groves... and the tour was stopping in Pennsylvania even more than once. 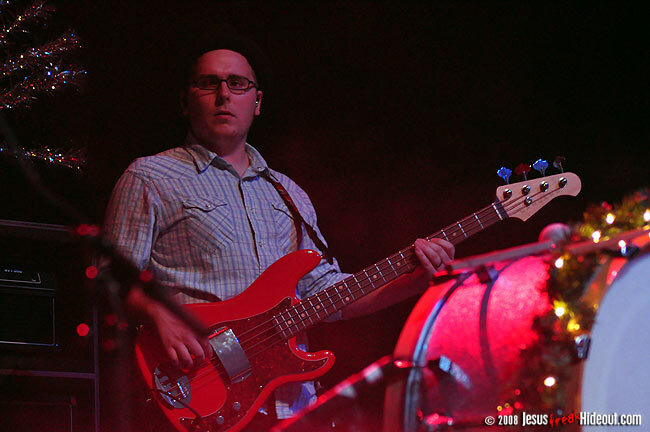 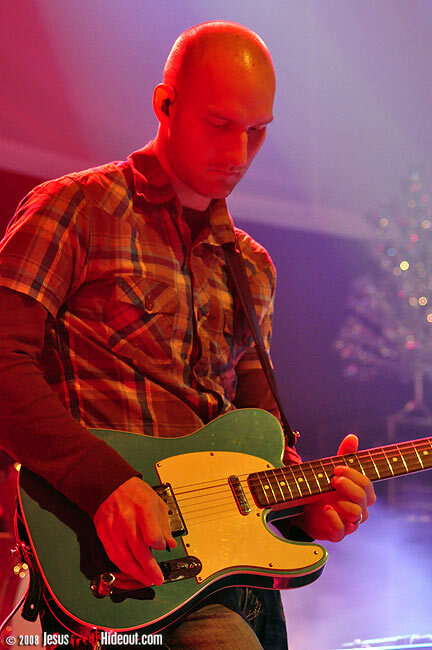 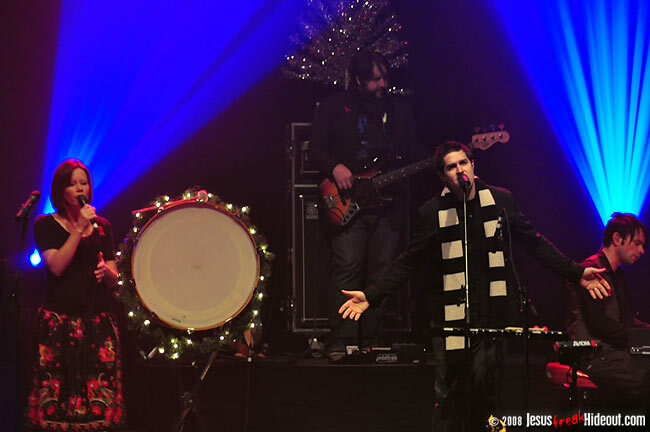 All of the artists on the roster sans Leeland had released a Christmas full-length over the past year, so Jars Of Clay's Love Came Down: A Christmas Pageant tour looked to be an exciting night of Christmas music. 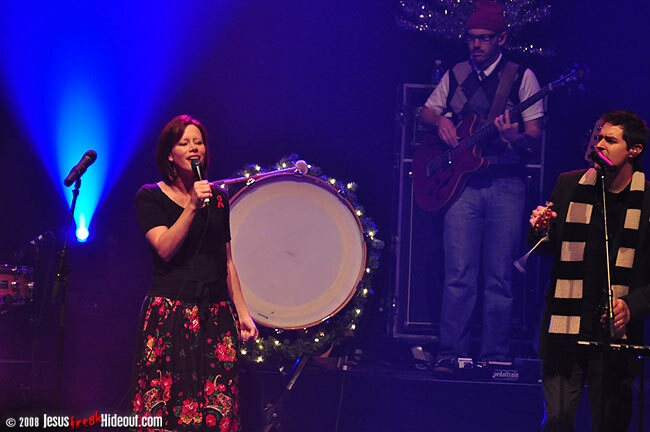 When we filed into the Keswick Theatre in Glenside, PA on a frigid mid-December evening, a warm Christmas feeling could be felt from the stage, which had been decked out in Christmas lights and pine garland, as well as a large screen to serve as a backdrop. 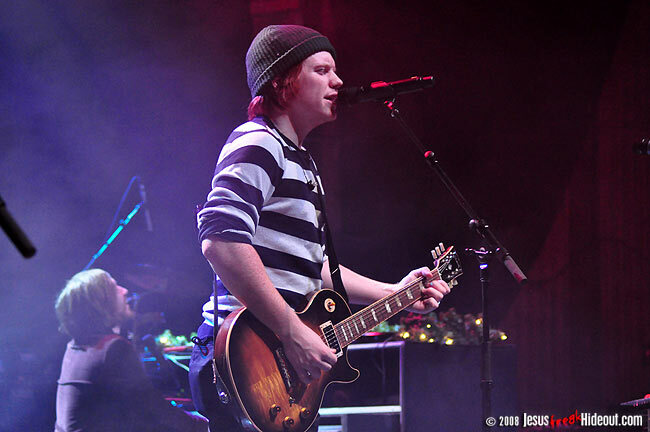 At about 7:30 on this Wednesday night, Leeland emerged on stage to the tune of "Noel," a unique spin on a familiar Christmas song. 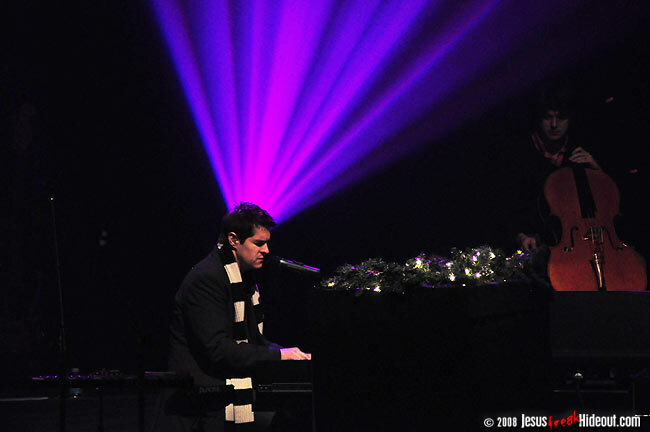 From there, however, the Texas modern worship act stuck to tunes they know well, forsaking Christmas covers to play four originals - "Sound Of Melodies," "Opposite Way" (a personal favorite), "May Our Praise," and "Count Me In." 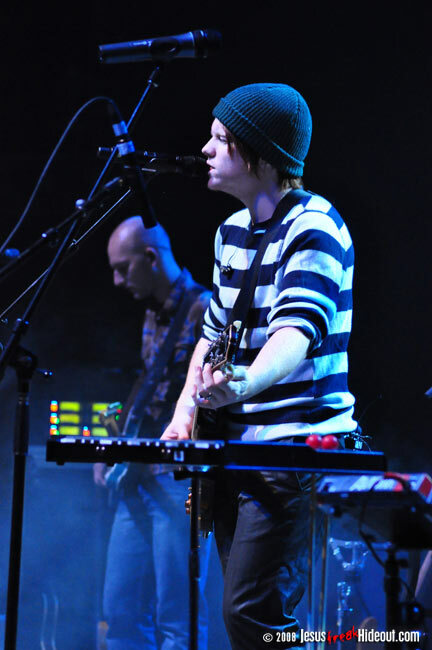 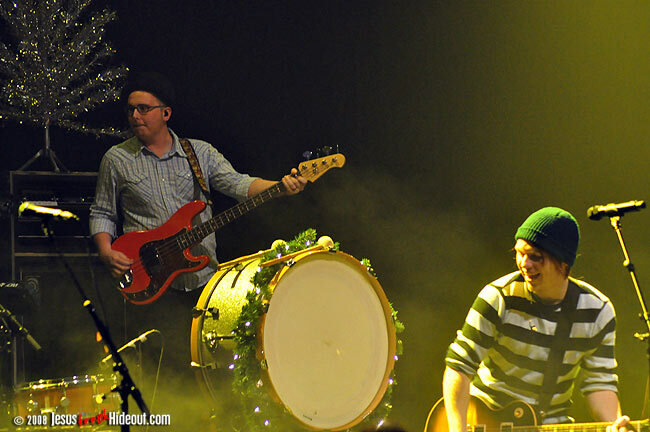 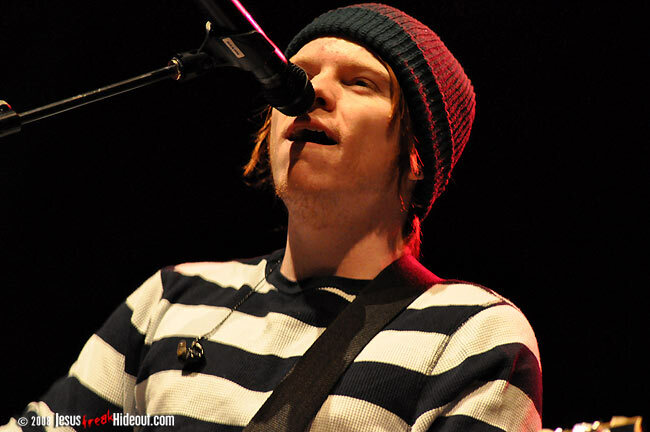 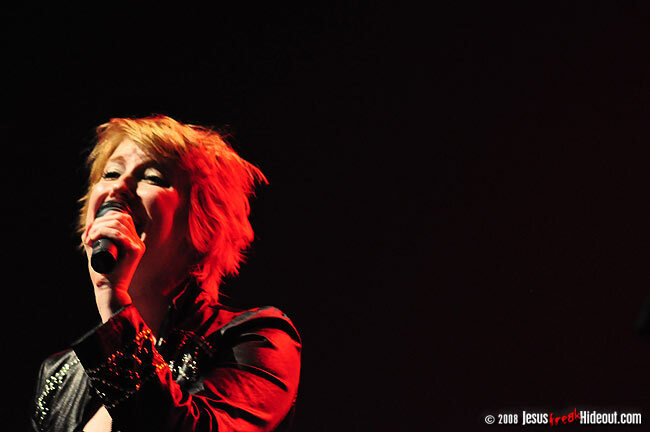 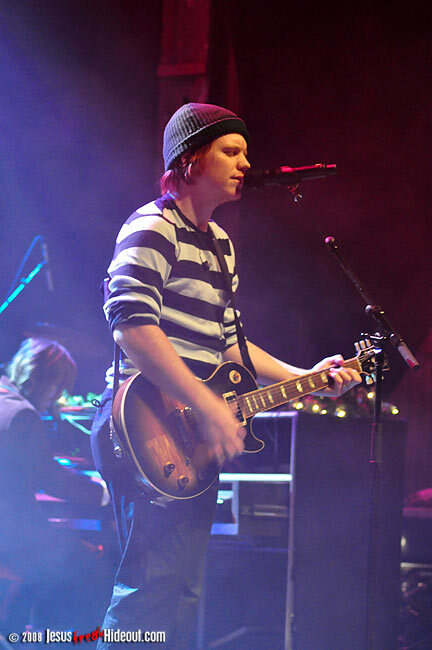 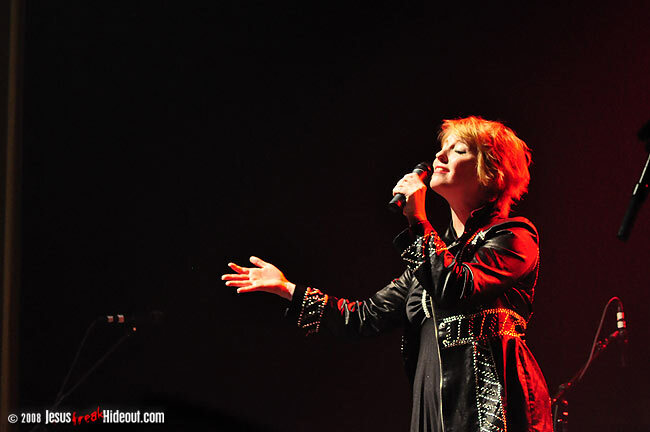 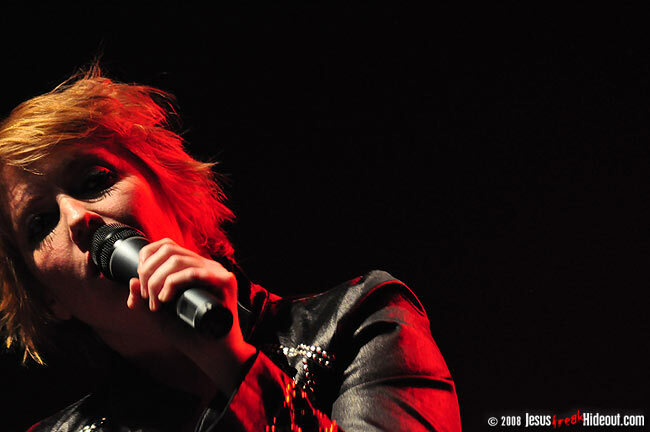 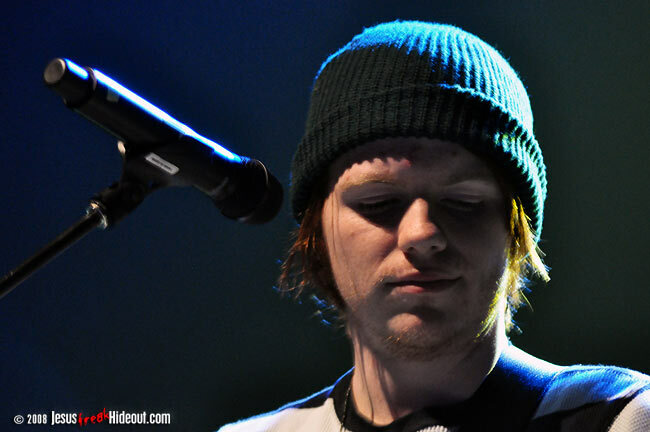 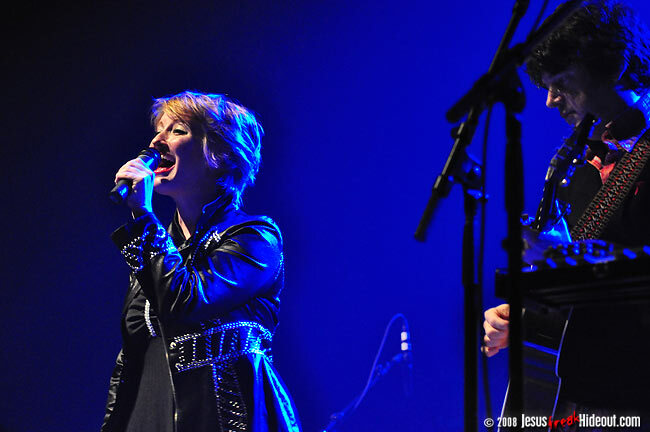 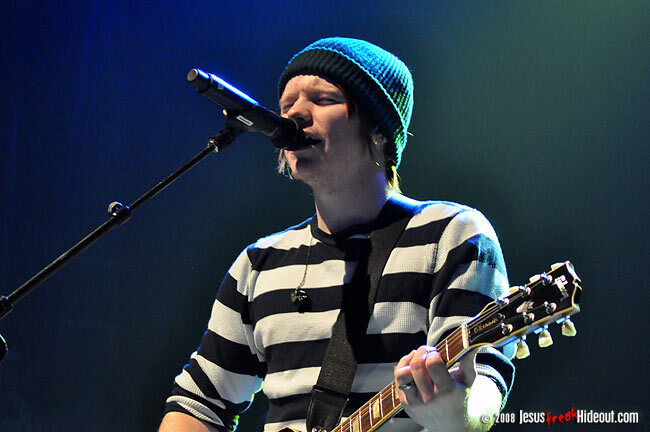 While their own worship material is always a pleasant and welcomed experience, it seemed a little out of character for the tour for Leeland to perform only one Christmas song out of the five they would play. 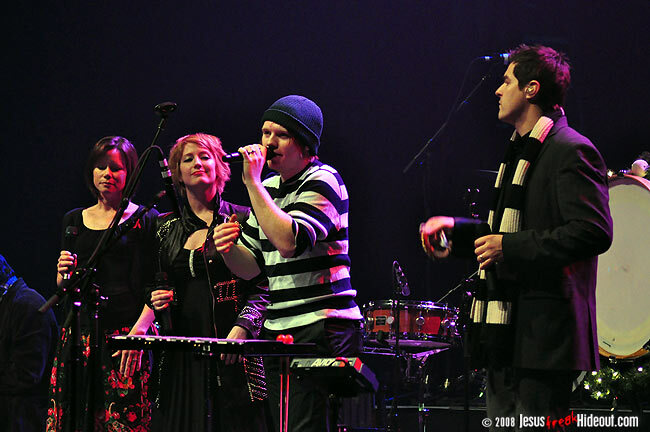 Still, the young band was a more than worthy kick-off for the evening, and the guys left the stage for the first of a series of video interludes. 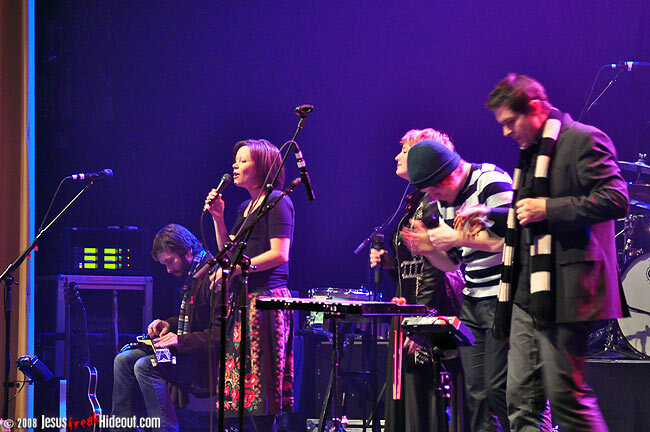 These video interludes, displayed on the screen behind the bands, rolled as the stage was prepped for the next acts, and the footage introduced four or five random people from different walks of life -- from a young child to a man literally living life just hiking for half a year from place to place. 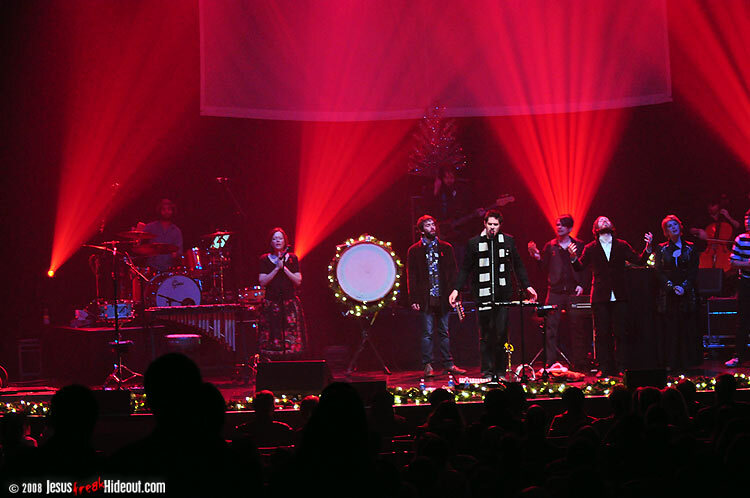 As the night unfolded, each successive interlude would reveal more about each person and their reflections on Christmas until the final interludes tied it all in to Jars Of Clay's charitable organization for helping the poor in Africa, Blood:Water Mission. 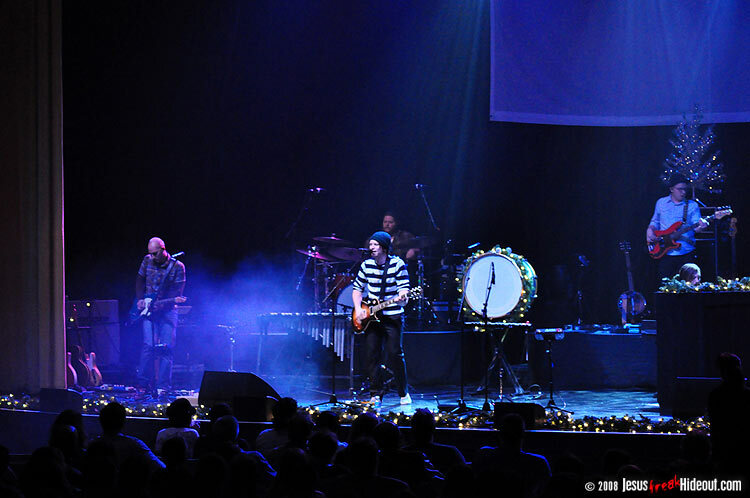 It was a unique way to fill time between sets and a way to encourage the concert goers to help without seeming too heavyhanded or pushy. 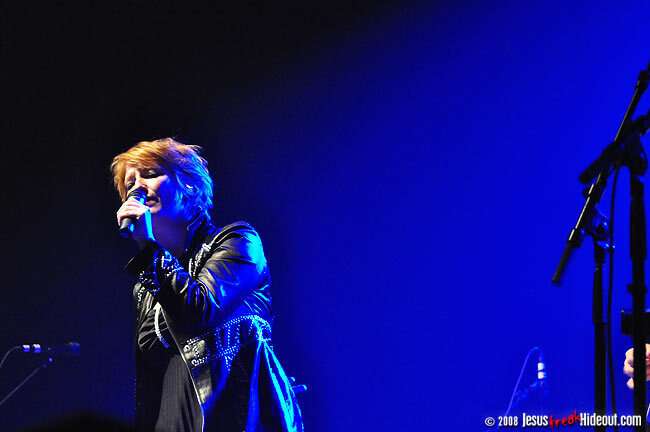 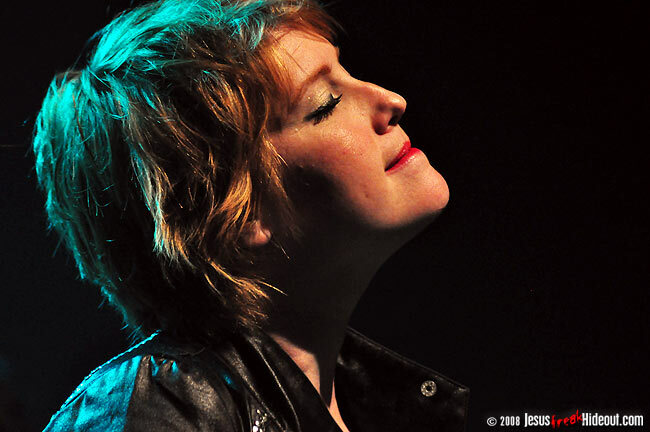 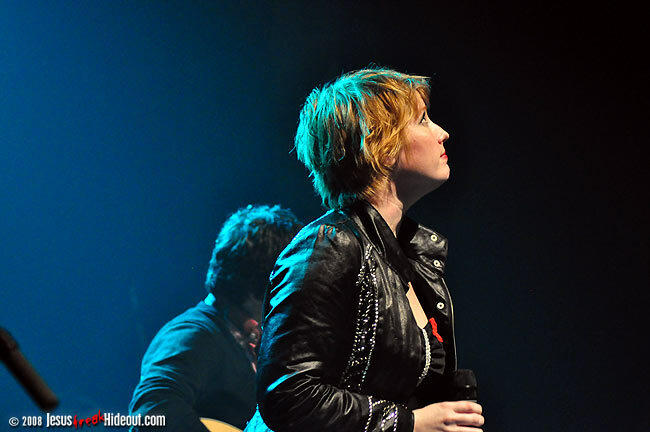 When the lights came back on, Sara Groves, Leeland Mooring, Leigh Nash, and Dan Haseltine stood side by side as Groves began "Star Of Wonder." 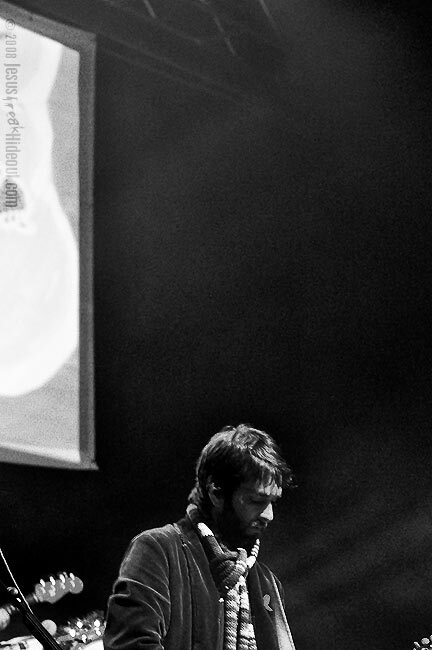 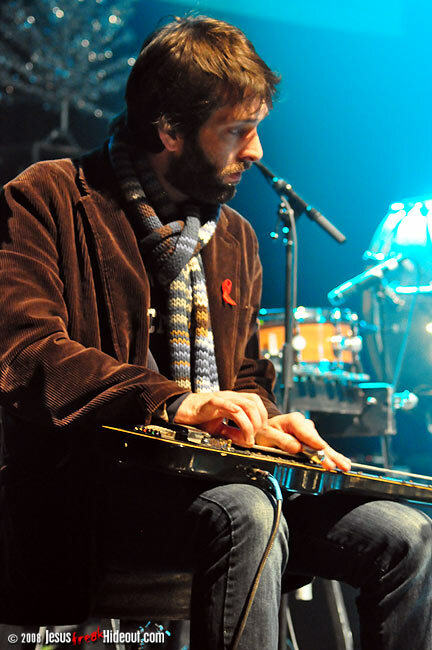 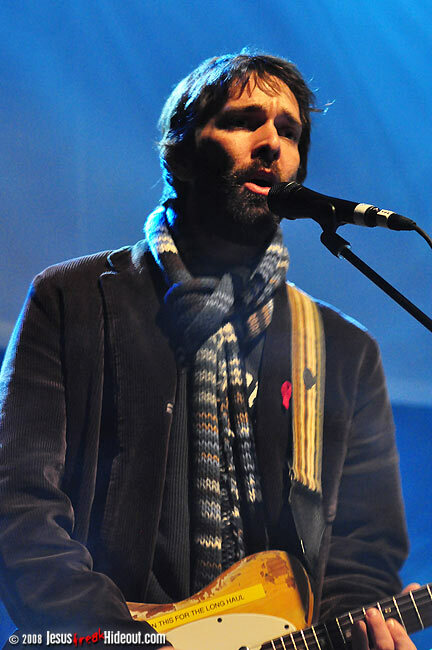 Upon completion of the song, Nash broke into "Angels We Have Heard On High," with Haseltine, Mooring, and Groves offering vocal support. 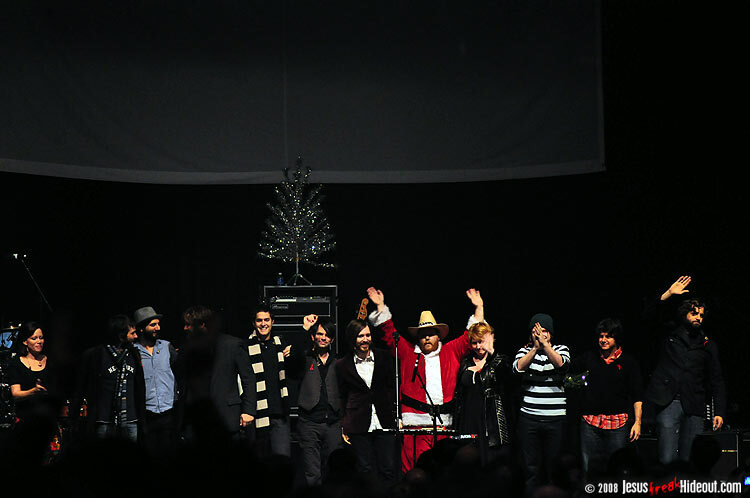 It was a wonderful almost encore-like collaboration that not only was rich with "Christmas spirit," but was a nice, unpredictable surprise. 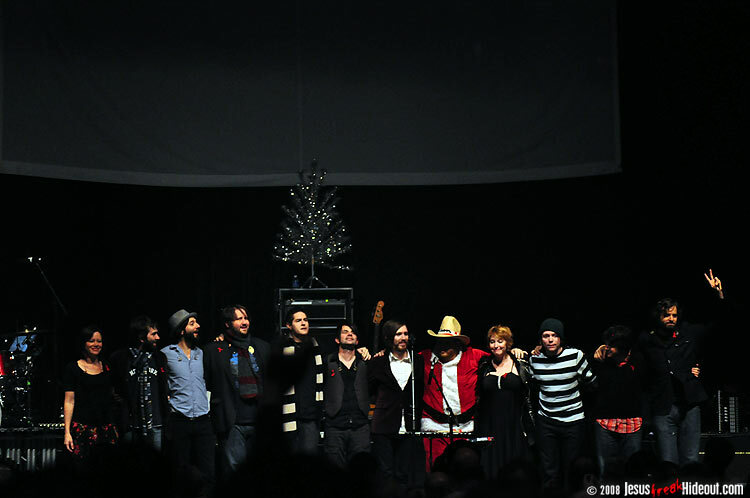 From here, the lights dimmed and another video installment aired as the stage was reset for the next act. 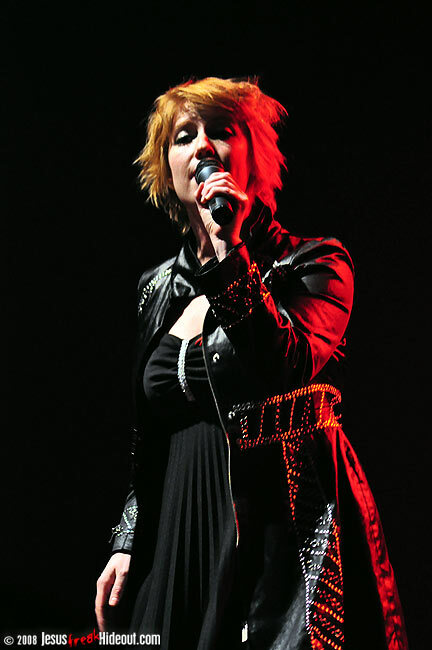 The newly reunited Sixpence None The Richer, who disbanded in 2004 but got back together earlier this year, was next on the evening's lineup. 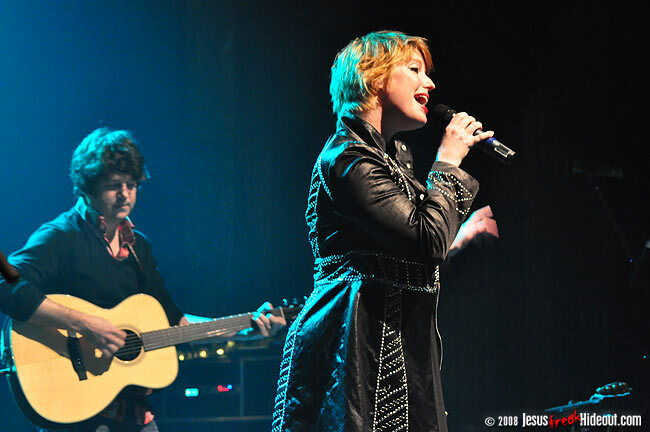 As just Leigh Nash on vocals and the multi-talented Matt Slocum providing cello and guitar when needed, the twosome opened with "O Come O Come Emmanuel." 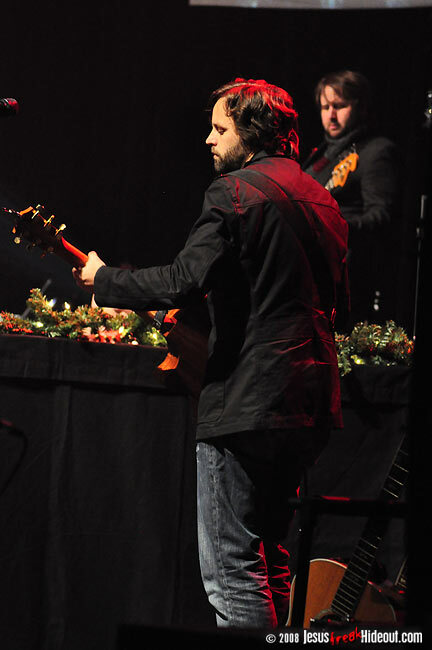 It was a treat to see Nash and Slocum performing again. 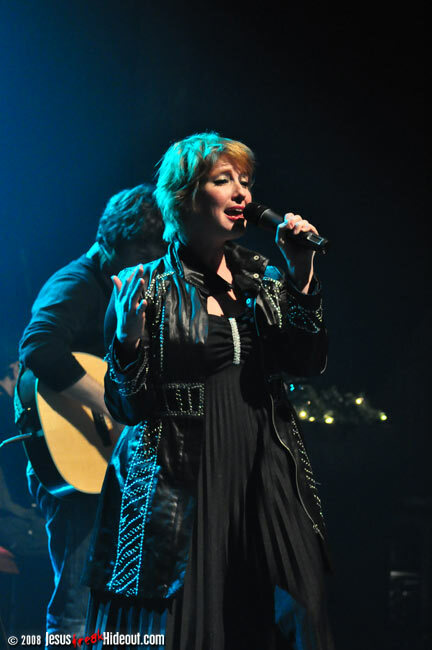 Nash seemed a little more melancholy in nature than during the previous incarnation of the band, but those familiar with her tumultuous recent years can empathize with the singer. 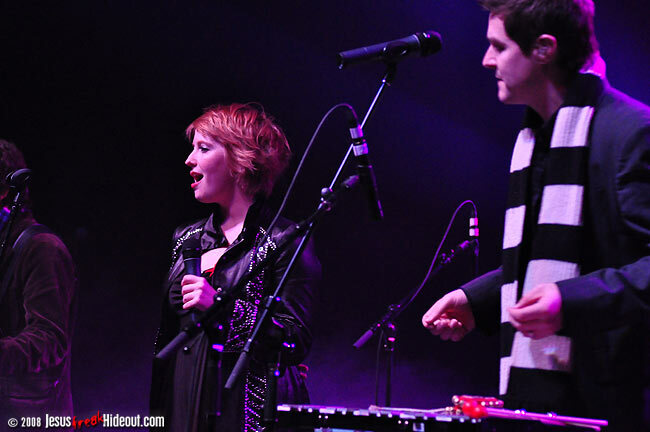 Her voice is still as beautiful and silky sweet as ever, and their sorely brief set was a highlight of the evening. 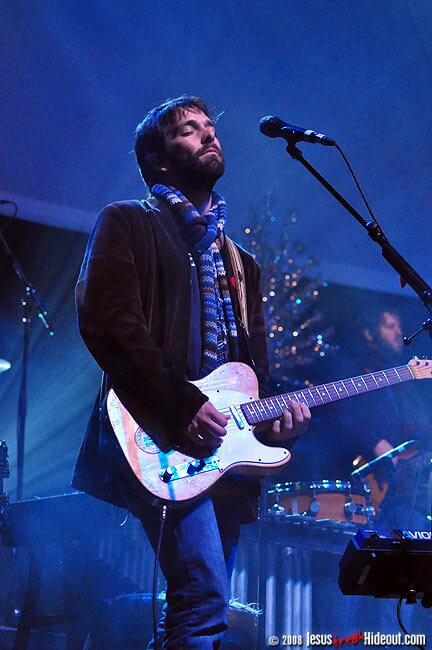 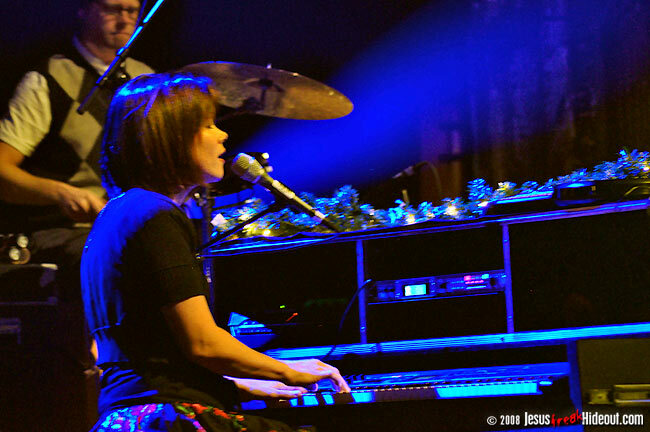 Before performing their cover of Joni Mitchell's "River," Nash apologized ahead of time for playing the sad song, but admitted the holidays can sometimes be as sad as they are happy. 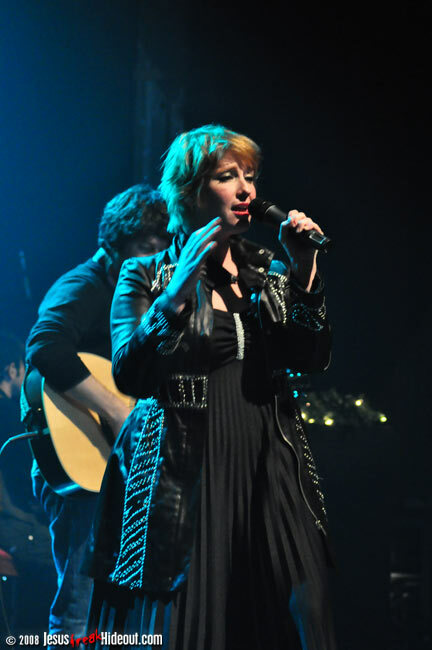 The pair then concluded their soft and thoughtful set with a couple of originals, "The Last Christmas" and "Christmas For Two," with both capturing the pensive mood Sixpence None The Richer has always been known for. 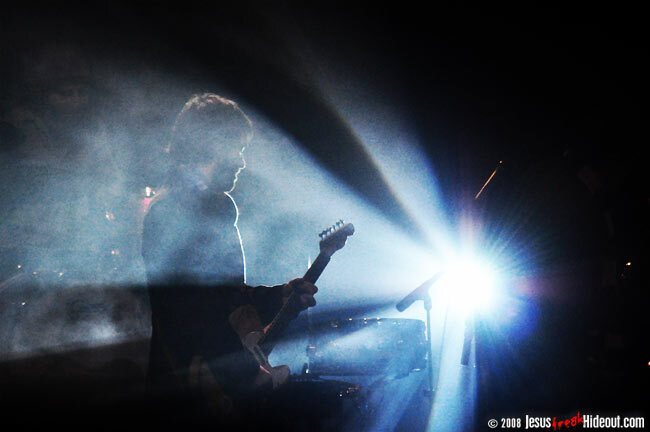 Another video interlude followed when the lights dimmed and Nash said goodnight. 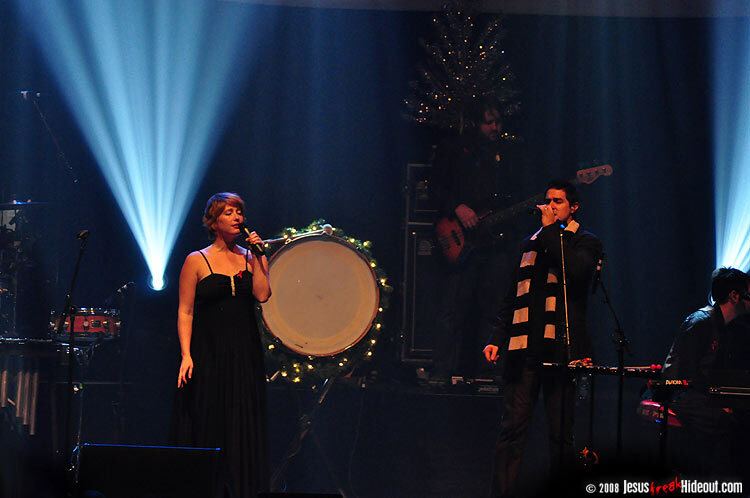 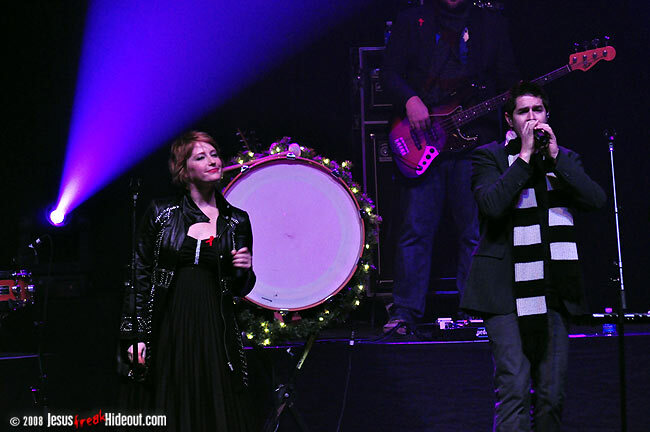 And when the lights came back on, Sara Groves, joined by Jars Of Clay's Steve Mason, as well as a couple members of her own humble band, opened with "Have Yourself A Merry Little Christmas." 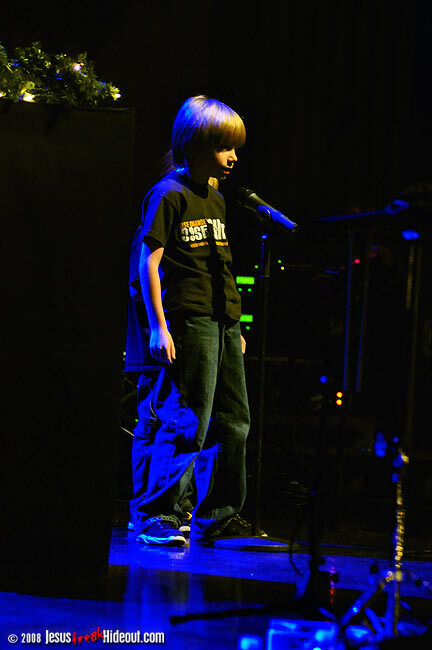 For the next track, an original titled "It's True," Sara invited her two little boys on stage to provide Scriptural spoken word accompaniment along with her soft and delicate vocals. 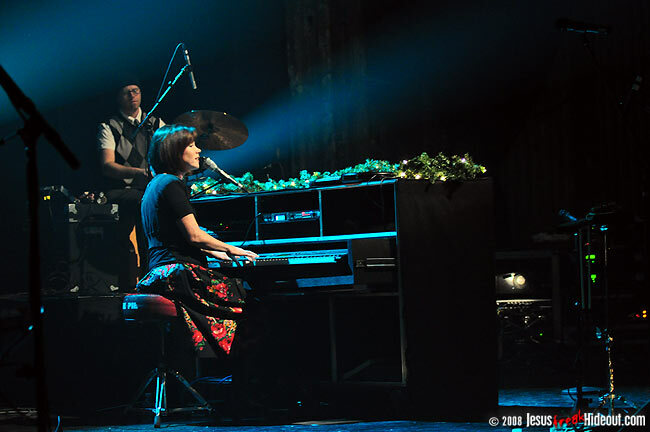 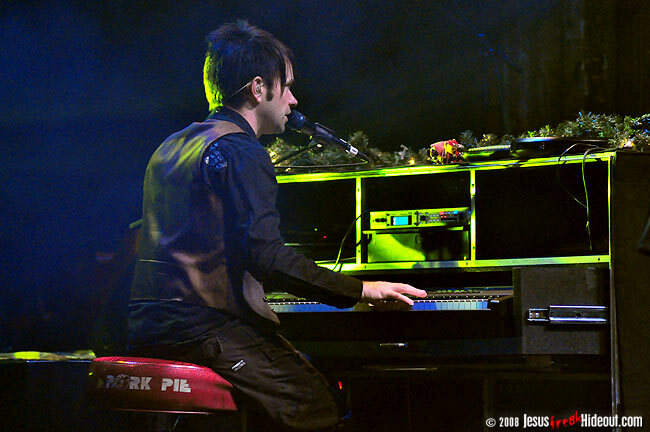 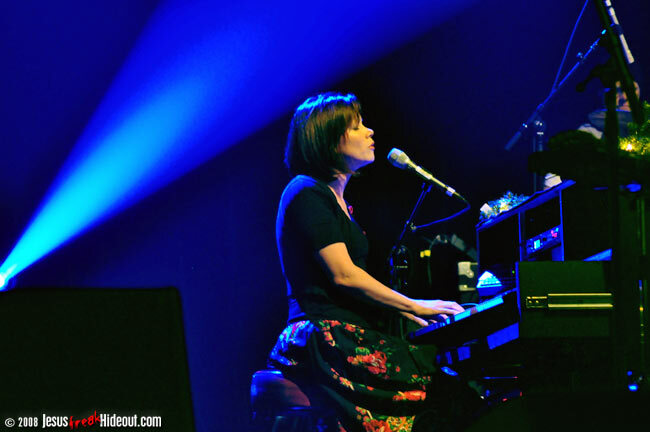 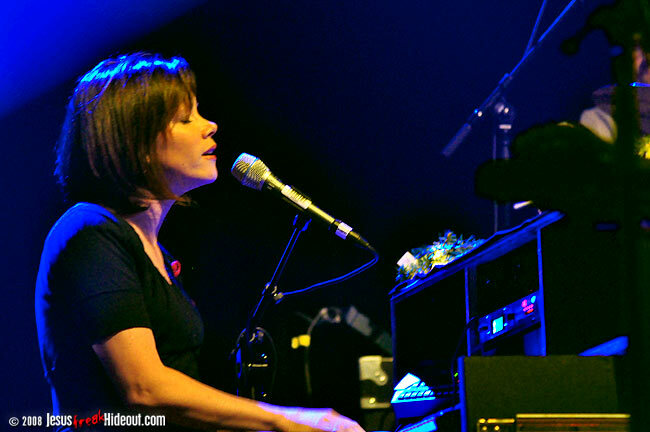 Groves remained seated at the piano for the duration of her set, while her husband provided drums behind her. 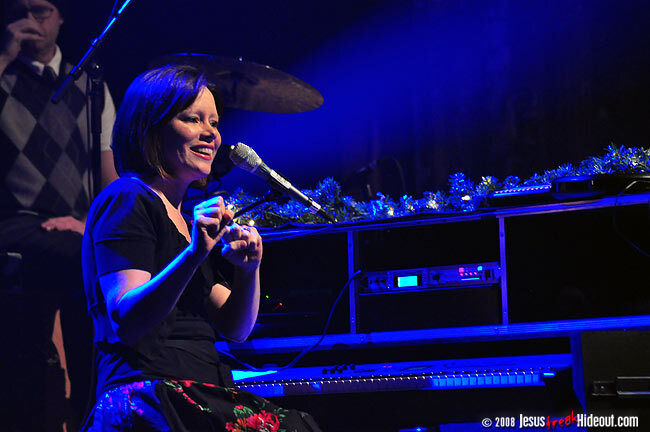 Groves preceded the delightfully amusing "Toy Packaging" with a humorous story about their recent admittance of pet peeves - with her's being quite literally the kind of excessive packaging that toys often come in. 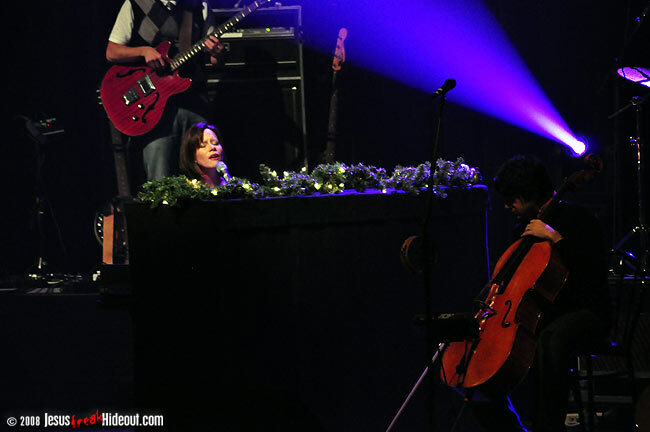 The bouncy piano-based tune (complete with additional sound effects provided by her husband), was followed by another original, "To Be With You," which Sixpence's Matt Slocum joined her for on cello. 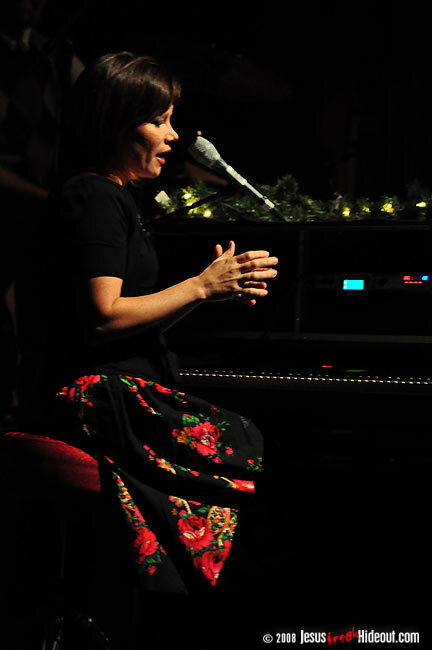 To close, Groves apologized in advance for changing the music for a well-known classic (admitting it fit her alto voice better as well as brought a new life to the beloved carol), and wrapped up her set with "O Holy Night." 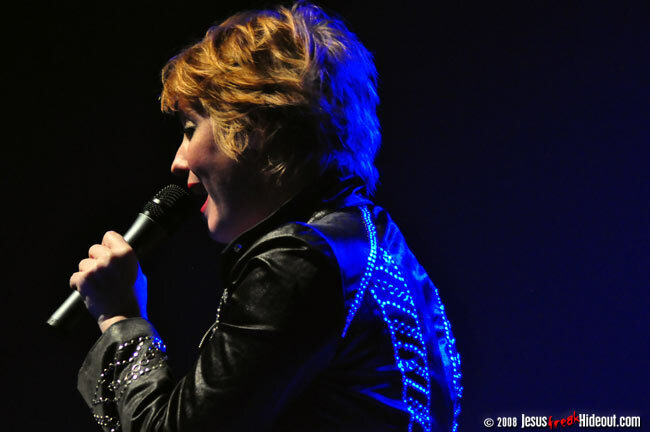 A fifteen/twenty minute intermission followed, complete with more videos, which allowed those in attendance to stretch their legs or meet Sixpence, Leeland, and Sara briefly out in the lobby. 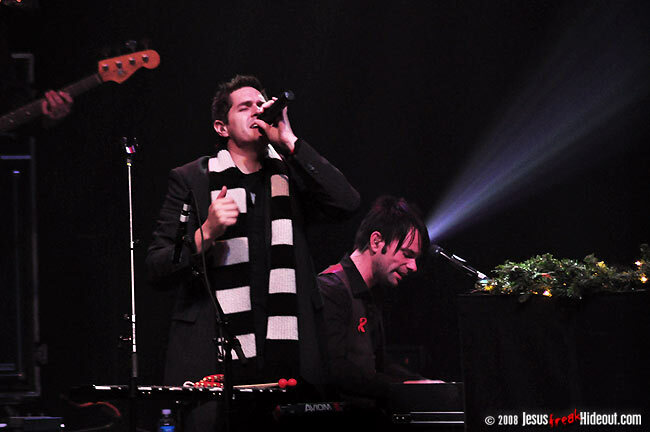 When the lights went out and the stage lights rose one last time, the beautiful sounds of the track for "The Gift Of St. Cecilia" played before Jars Of Clay opened their Christmas headlining spot with "God Rest Ye Merry Gentlemen." 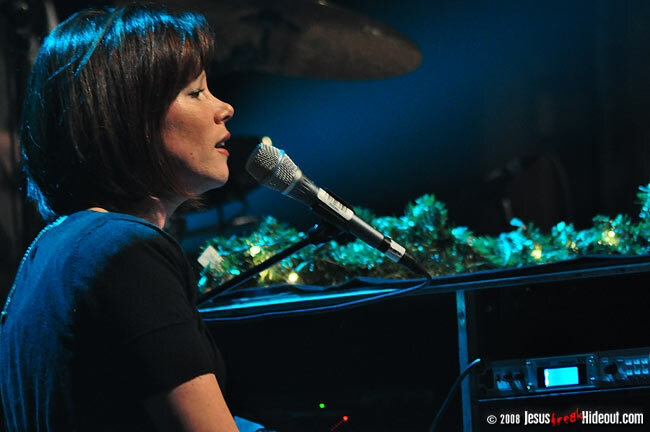 This particular carol is among the fan favorites as the band first recorded a rendition the same year their self-titled debut released in 1995. 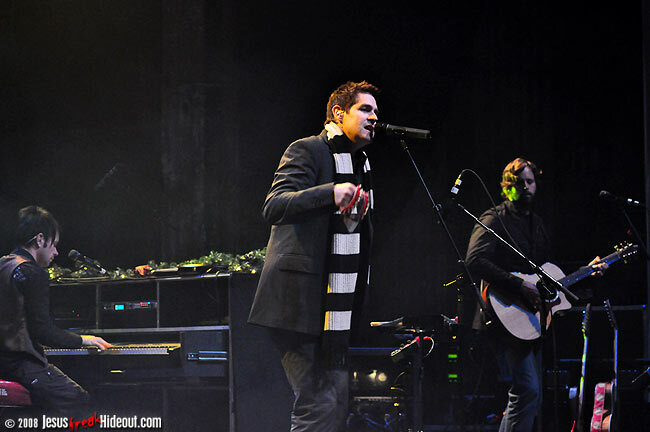 Last year, for their full-length Christmas project, Christmas Songs, the guys re-recorded it with a fresh new rendition. 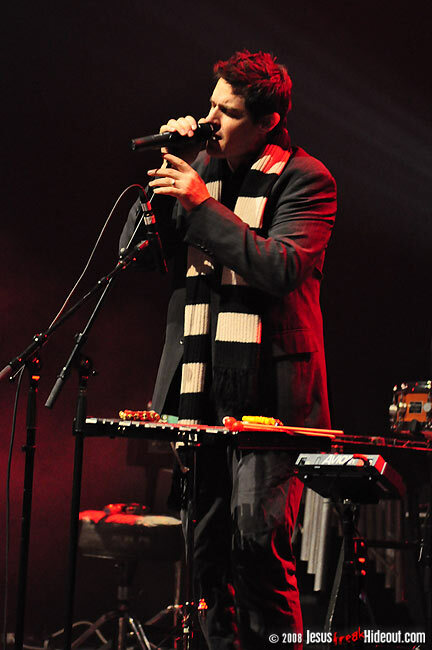 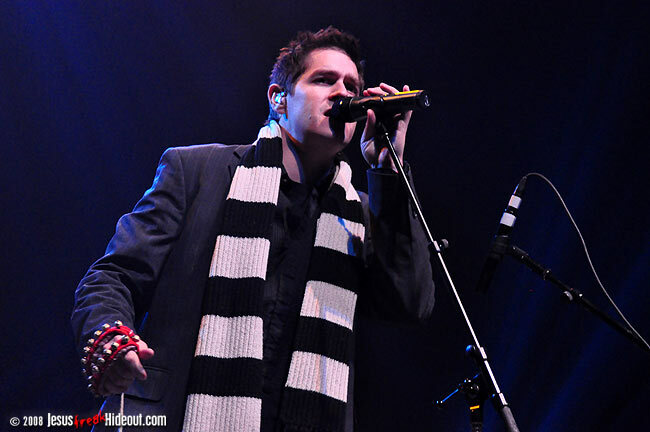 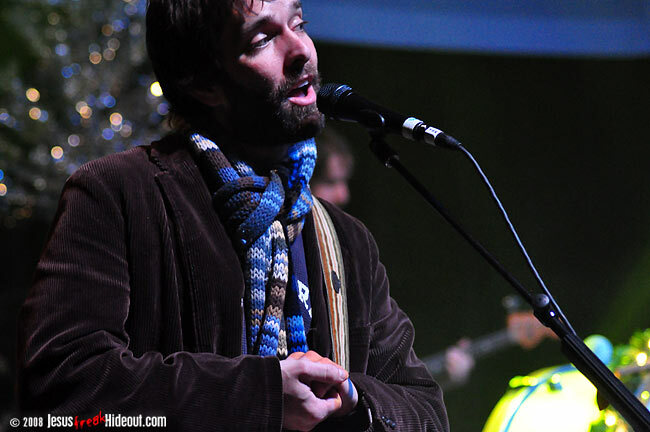 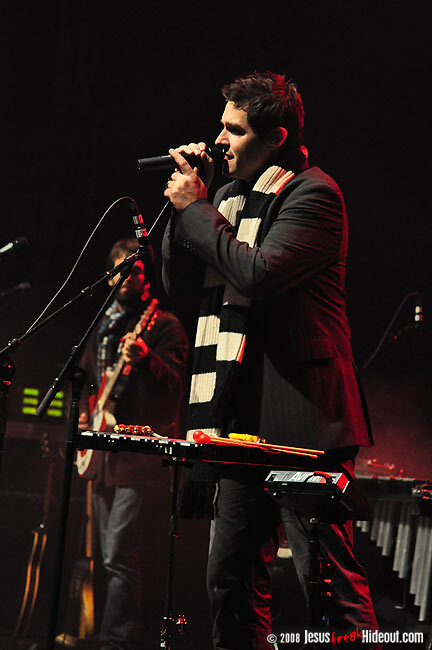 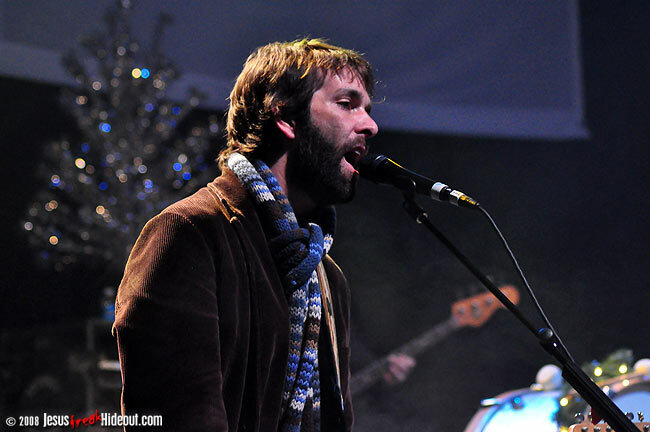 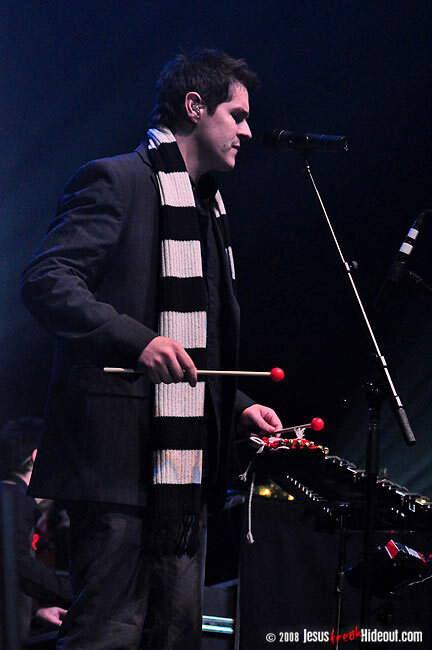 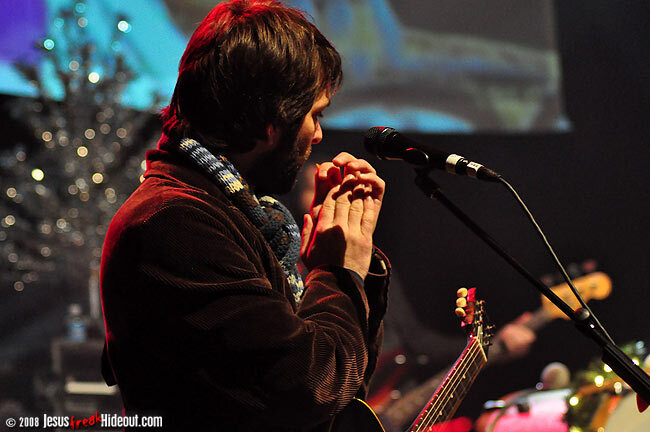 Vocalist Dan Haseltine, who would provide various percussion accompaniment throughout the evening, sported a long scarf around his neck, while the rest of the band (as well as the other artists that graced the stage throughout the night), sported various warm wintry garb. 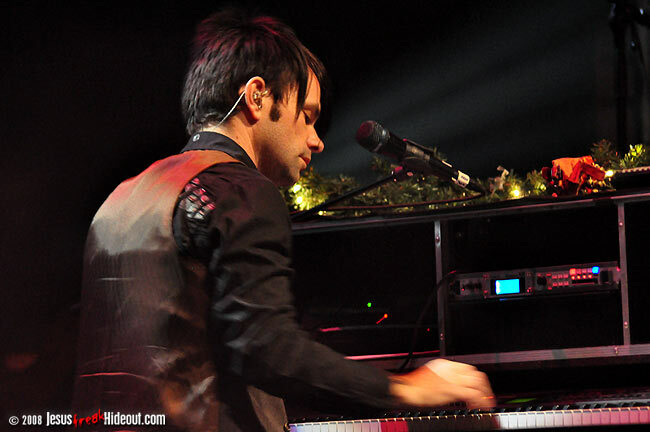 Their cover of Paul McCartney's original, and a highlight of Christmas Songs, "Wonderful Christmastime," followed, before Haseltine paused to greet the crowd and then perform the tour's titular song, "Love Came Down." 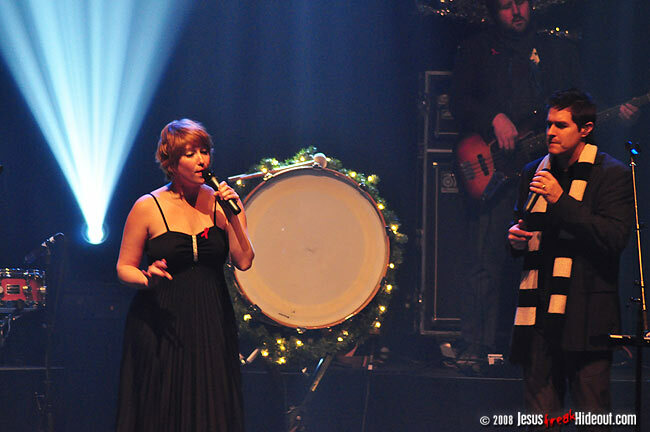 Haseltine then addressed the romantic side of the Christmas season, and invited Leigh Nash back on stage to perform the frisky and fun "Hibernation Day" with them. 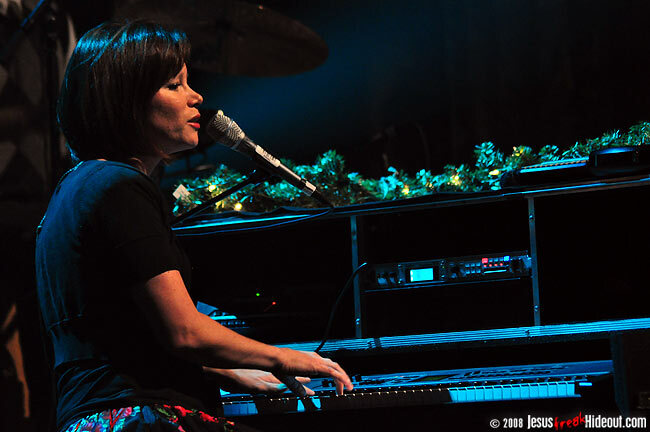 The Peanuts cover "Christmastime Is Here" (which, incidentally was also previously recorded wonderfully by Sixpence) was next, with their dark rendition of "O Little Town Of Bethlehem" close behind. 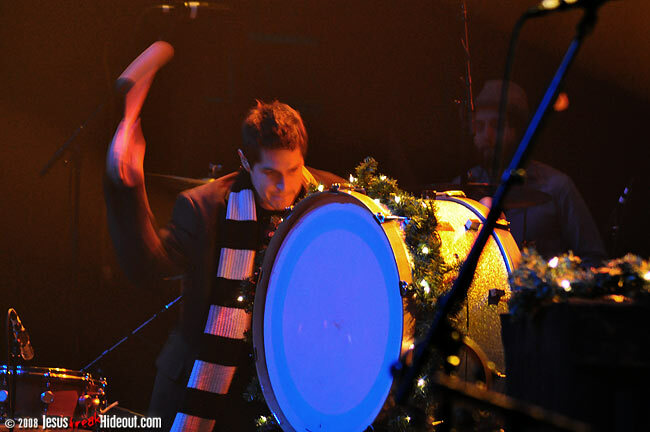 For the entire evening, a standing bass drum circled in Christmas lights served as sort of a set piece, but was finally utilized by Haseltine for "Bethlehem's" finale. 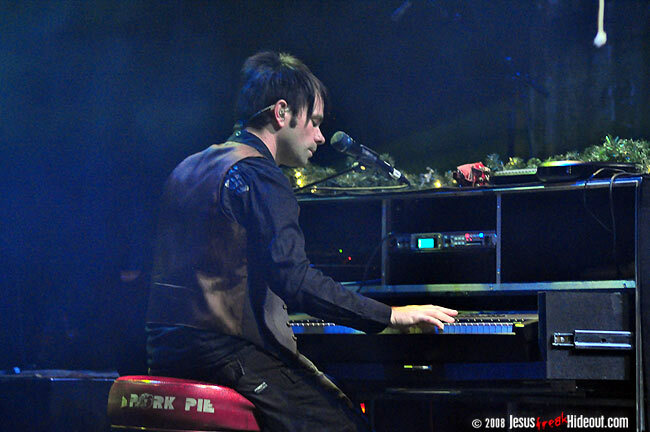 At this point, the stage went dark and another Blood:Water video interlude displayed on the screen above, and when the stage lights came back on, Dan was seated at the piano to play the beautiful "Winterskin," with the band's pianist, Charlie Lowell, providing the accordian. 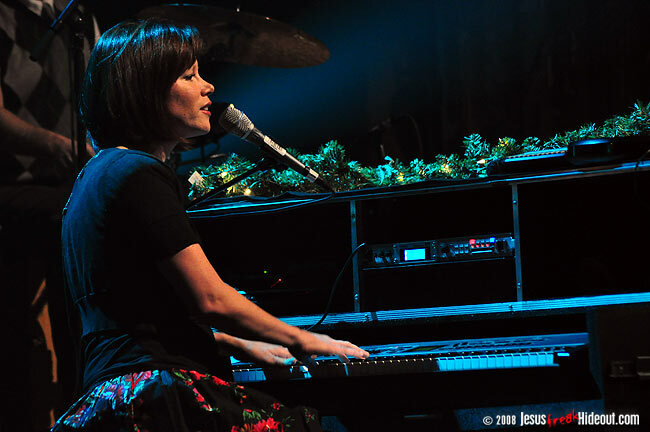 During the night, the video screen would also show different patterns or even music videos for Jars, and at this point, an illustrative starry night was a nice compliment to the dreamy tune of "Winterskin." 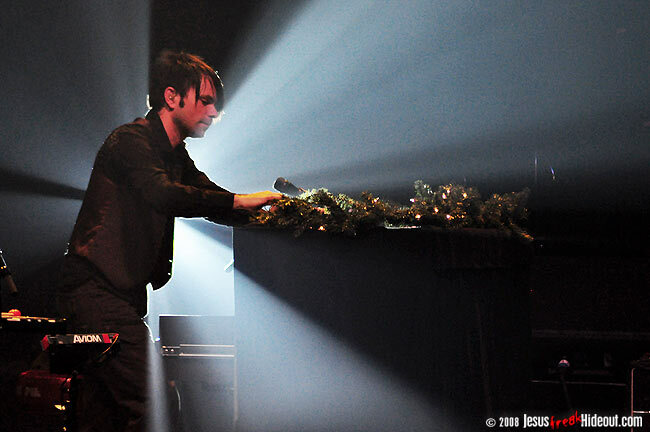 Afterwards, Haseltine began to talk again about the importance of Christmas music, speaking seemingly seriously about how one particular song always meant so much to the guys and how honored they feel to be able to perform it live for us. 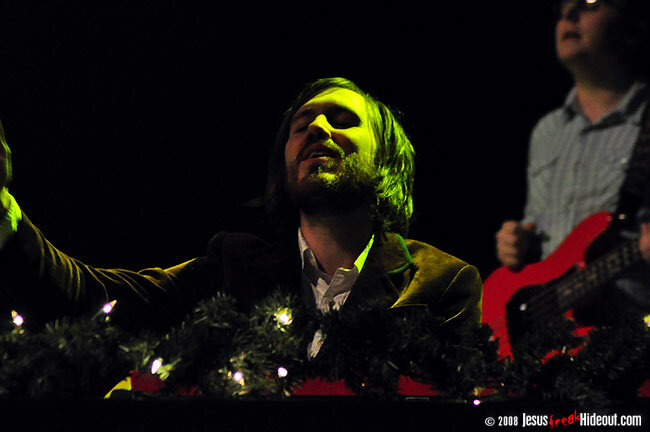 After he branded the song as one of the most important Christmas songs ever written, the guys broke into a spot-on rendition of "The Chipmunk Song" - AKA, "Christmas Don't Be Late." 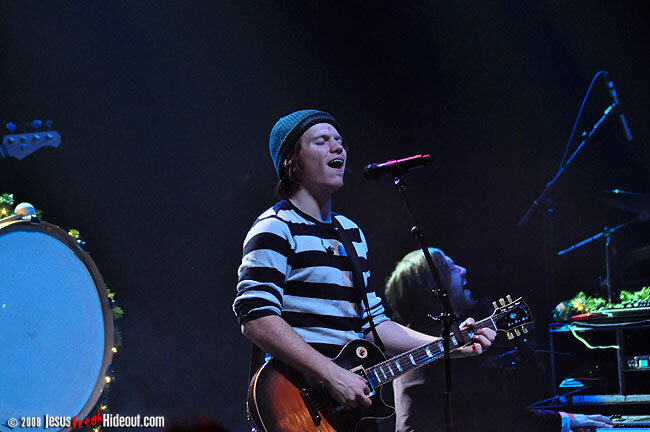 With vocal effects on their mics, the guys captured the high, squeaky chipmunk vocals perfectly, as they caught the Glenside attendance by surprise. 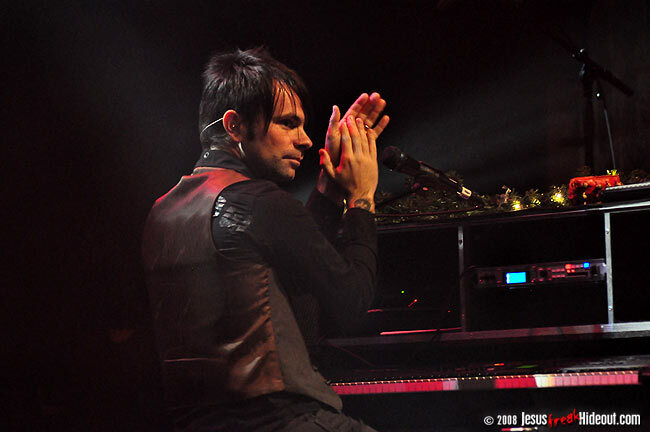 With the song's conclusion, the crowd roared with applause before Haseltine joked, "Now you won't believe anything else I say tonight!" 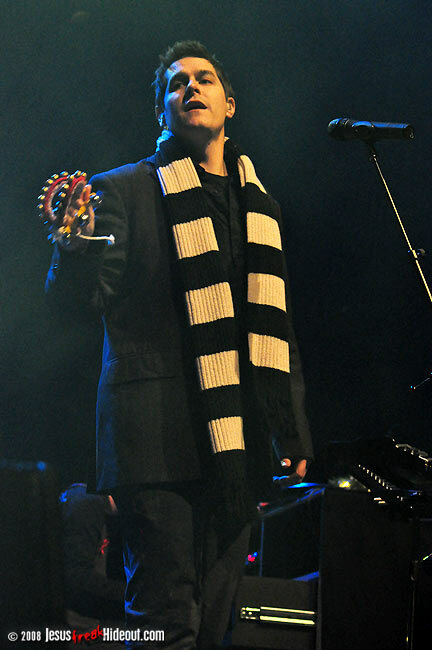 From there, he more seriously talked about Christmas music and his personal favorites (from Jackson 5 to Jon Denver and The Muppets), and spoke about a particular song he listens to first every year. 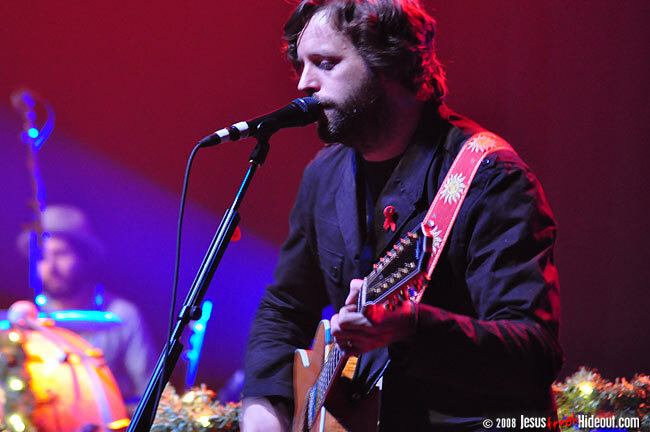 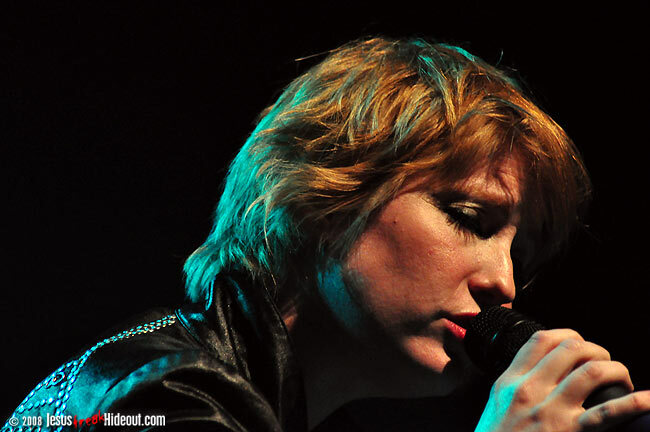 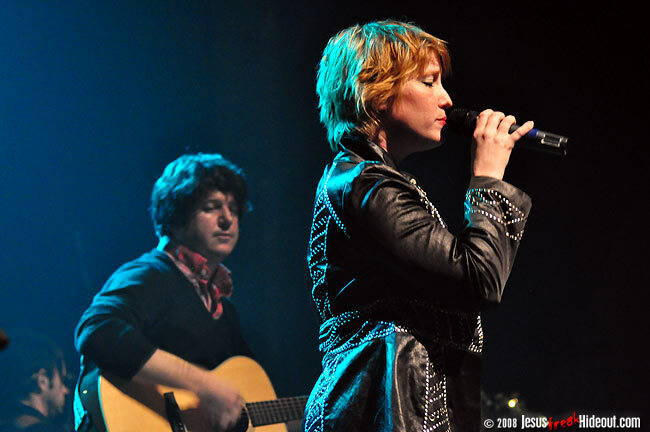 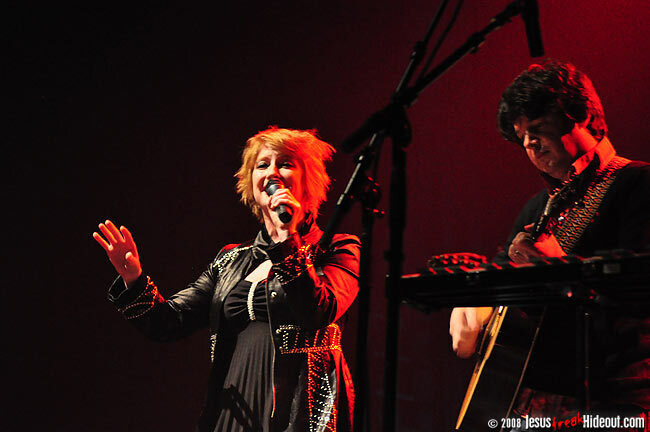 The band then covered "Christmas For Cowboys" before inviting Leigh Nash and Matt Slocum back out to perform Sixpence's rendition of "Silent Night" (which Dan also provides guest vocals on for their new album). 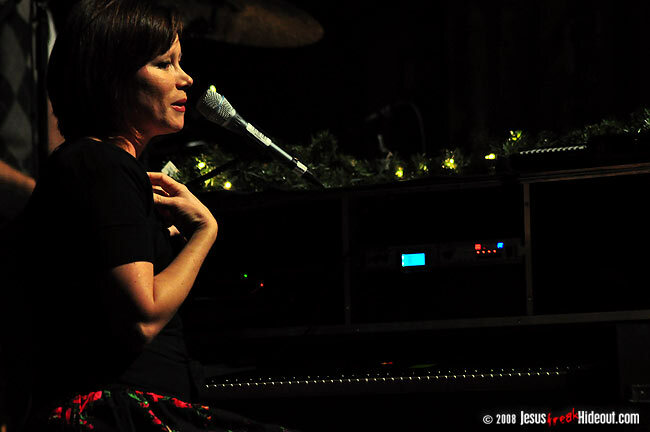 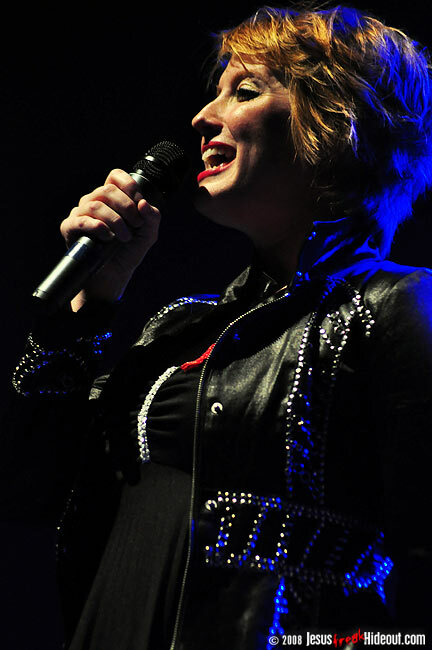 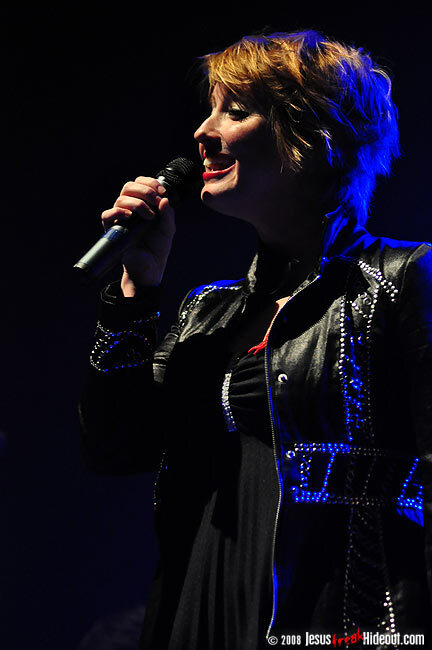 When Nash exited, Haseltine invited Sara Groves back out to help sing "It Came Upon A Midnight Clear," with the finale turning into a singalong for "Glory, Hallelujah, Peace on Earth!" 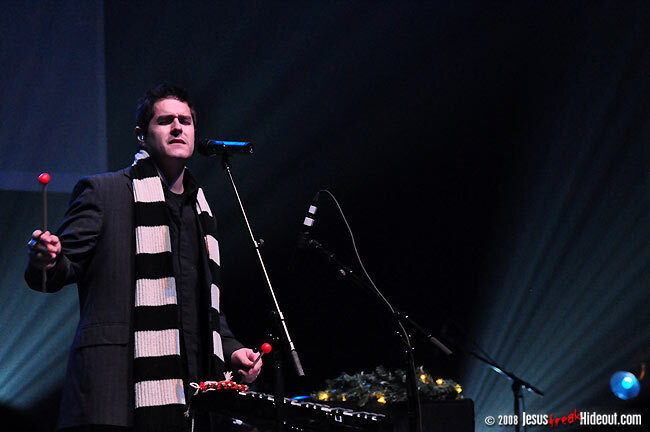 Jars Of Clay then closed their set with two more Christmas Songs offerings: "Peace Is Here" and "The Little Drummer Boy" (which concluded with Dan banging on the large drum once again). 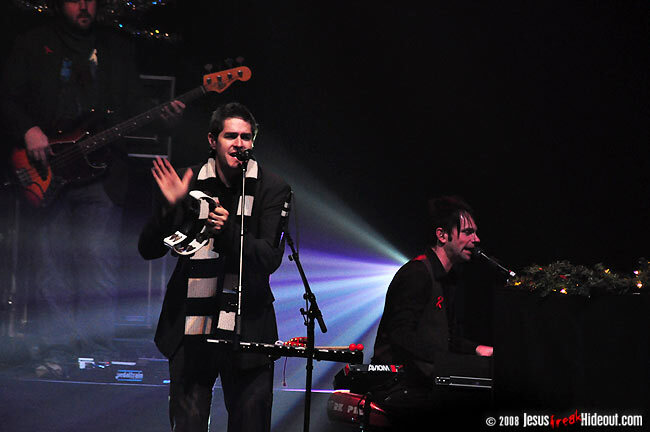 After the band waved goodbye, the lights went dark again and people began to leave, assuming the night was finished. 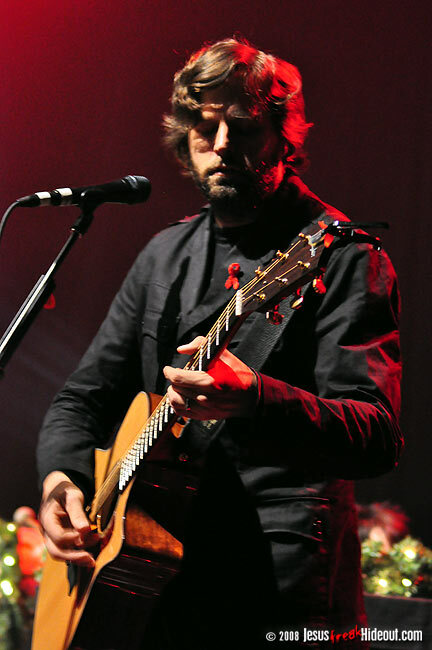 But after one last video appeared on the screen to promote Blood:Water Mission, some of those leaving stopped in their tracks and sat down as soon as Dan Haseltine came back out and reassured the audience that more music was coming. 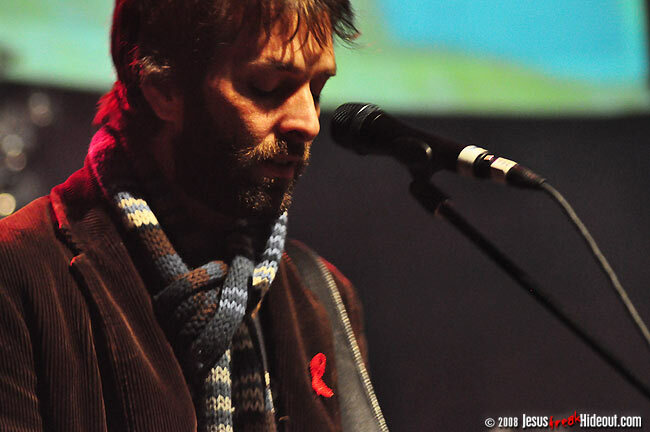 Carrying an empty gift sack, Dan talked about Christmas and Blood:Water, urging the audience to "be peace in the midst of chaos" for those in Africa. 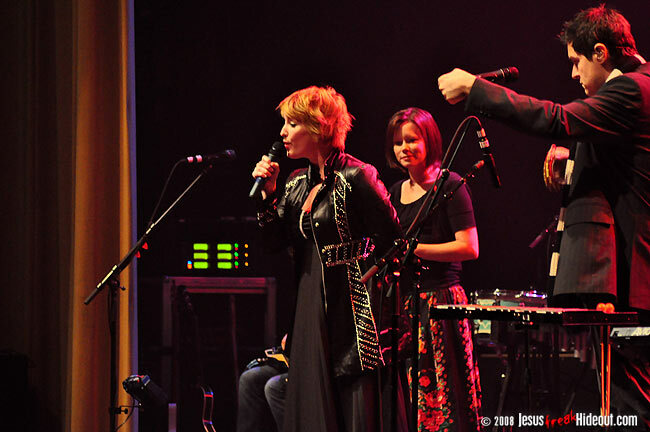 The gift sack was an example of the offering collection vessels the concert attendees could contribute to Blood:Water in, and before the night was over, almost three thousand was raised for the cause! 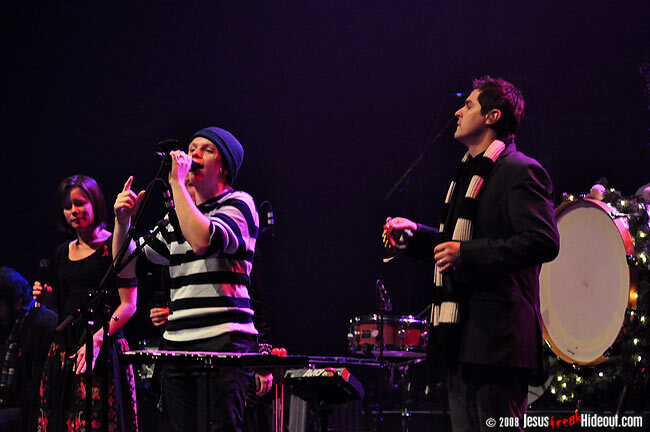 But once the rest of Jars joined Haseltine on stage again, Groves returned to help with singing "I Heard The Bells On Christmas Day," while Haseltine utilized his signature melodica for the song's closing. 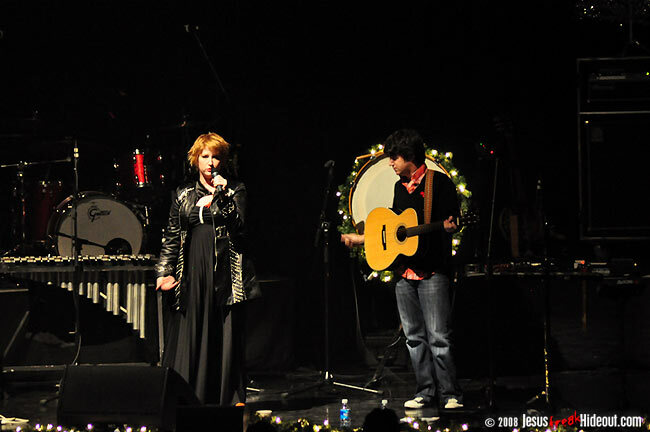 Leeland and Sixpence also joined Jars and Groves to sing "O Come Let Us Adore Him," and Dan urged the audience to sing along (and lyrics even displayed on the screen) for the very last song, "Joy To The World," which everyone sang before the night's artists took a bow together and cleared the stage. 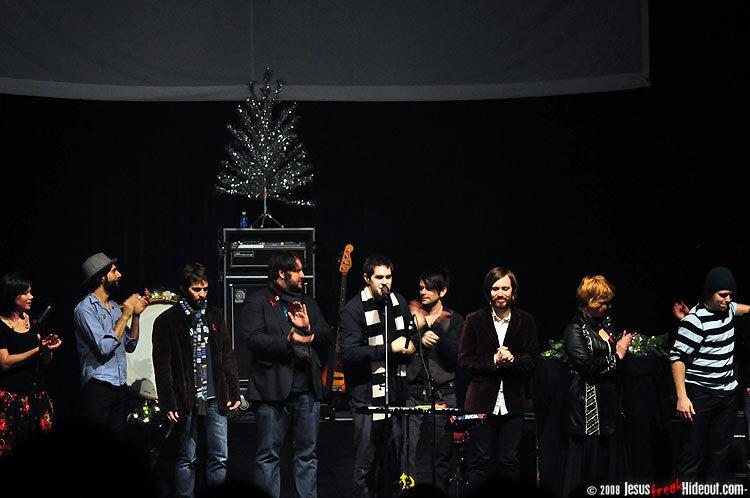 With a lineup like that of the Love Came Down: A Christmas Pageant tour, great things can be expected. 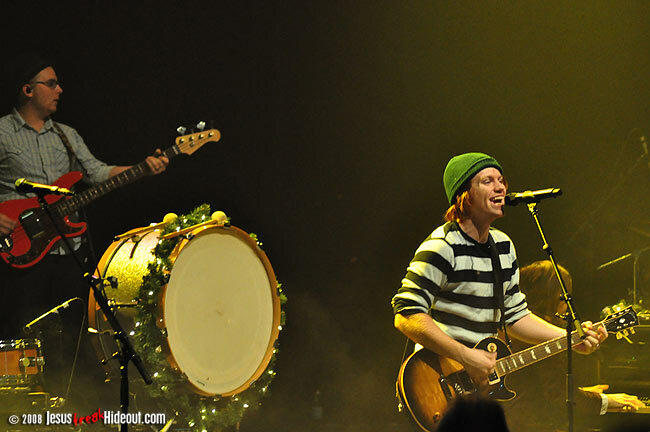 And without fail, great things were delivered. 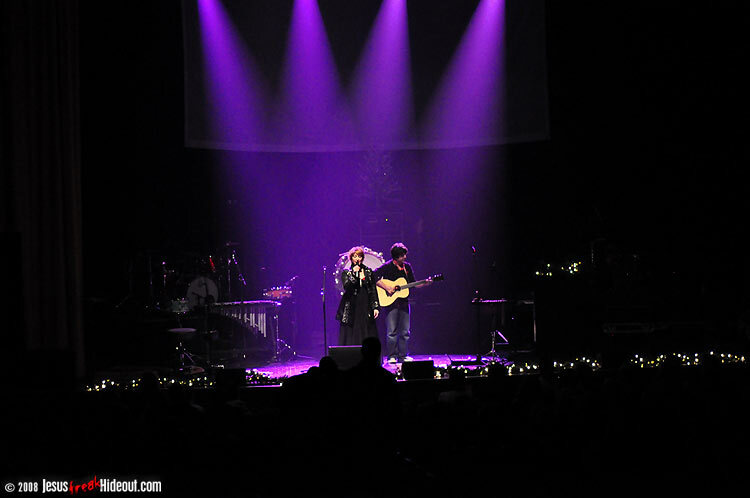 After Leeland opened, performing mostly signature songs of theirs, I was pleasantly surprised to find each artist that followed stuck to entirely Christmas tunes -- establishing and sustaining the spirit of the night. 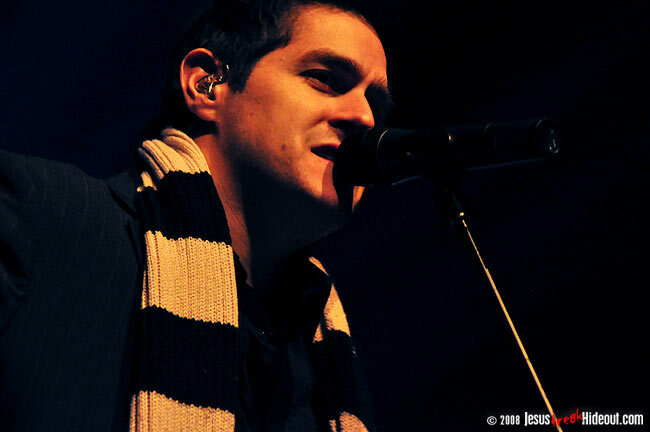 Even the headliners, Jars Of Clay, who have a wealth of music to choose from, refrained from indulging in a single familiar non-seasonal song. 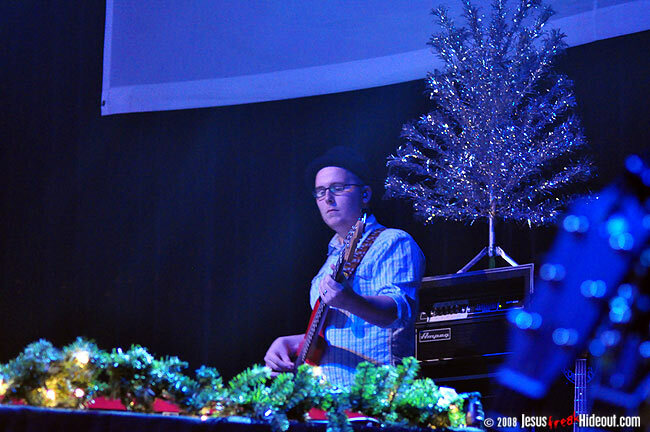 It was a real treat to have that kind of devotion to the Christmas theme. 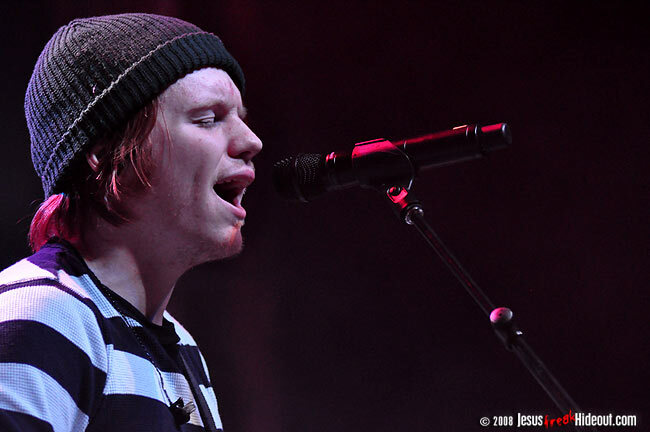 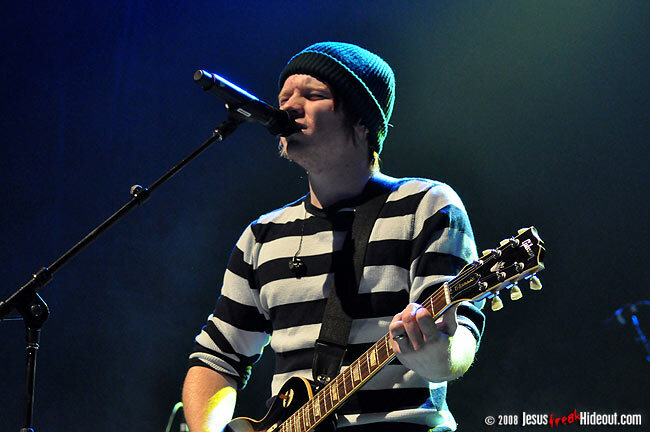 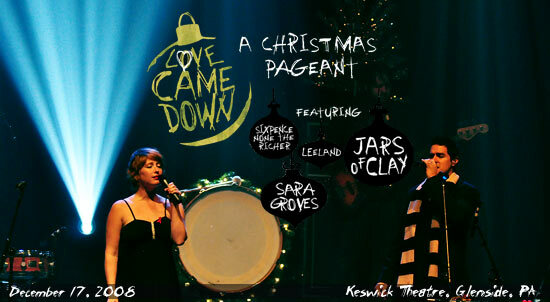 Love Came Down: A Christmas Pageant Tour proved to be one of the most solid and enjoyable tours of 2008, and an event I wouldn't recommend missing if any of the remaining dates are within your reach. 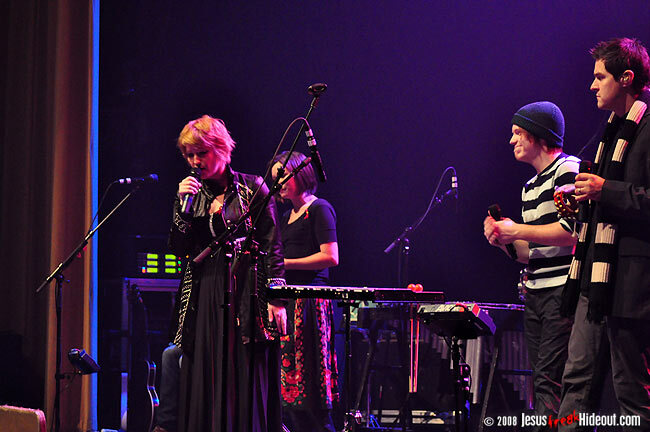 And even if you miss this particular tour, don't miss any of these artists individually in the future - especially if it's a part of anything as delightful as the Love Came Down Tour.